We are proud to introduce our new signature : the french band DopeGems. These guys play real jazz-funk with an hip hop attitude. As their band name says, they only play cover of Dope… gems. Rare tracks of the late 70′s and early 80′ from OST or valuable vinyl. 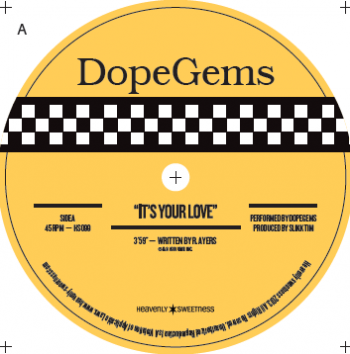 Following their acclaimed first 7inch “Journey to the shore” (supported by Gilles Peterson, Nik Weston, Lefto, Gerald Jazzman, Melting Pot, soul spectrum…), the band comes with their second EP. 2 tracks, 2 covers : the Uno melodic classic “It’s your love” by Ethel Beatty, sampled by NTM / Baby T / Troubleneck brothers… and “I work the whole city” from the cult “Taxi driver” OST. Découvrez notre nouvelle signature : DopeGems. Un groupe de jazz funk avec la hip hop attitude. Comme l’indique leur nom, ils ne jouent que des Dope… Gems. C’est à dire des petits bijoux, déniché sur des BO ou des vinyle rares de la fin des 70’s et du début du 80’s. Suite au succès de leur premier 45 tours “Journey to the shore” (soutenu par Gilles Peterson, Nik Weston, Lefto, Gerald jazzman, Melting Pot, Soul Spectrum…), le groupe arrive avec un nouvel EP 45 tours. 2 titres, 2 reprises : le classique de Uno Melodic “It’s your love” de Ethel Beatty, samplé par NTM et “I work the whole city” extrait de la superbe BO de Taxi Driver.